Arthritis isolated to the radiocapitellar joint. Most common etiologies: late sequela of either radial head fracture, capitellar fracture, chondral contusion of the capitellum, or osteochondral lesions of the capitellum. Must rule out medial elbow instability and DRUJ instability. 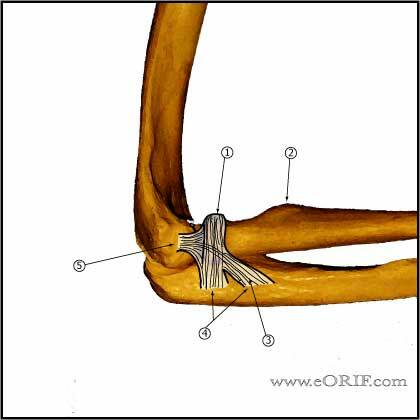 A/P, lateral and oblique elbow films indicated, generally normal. Arthrogram MRI: consider to evaluate for loose bodies. Nonoperative: NSAIDs, activity modifications, avoid activities which load the joint, ROM exercises for flexion, extension, pronation, and supination should be performed to prevent further loss of motion and function. Radial head excision, with or without a radial head replacement: 80% good outcomes. Consider arthroscopic radial head excision (Menth-Chiari WA, Arthroscopy 2001;17(9):918). Avoid radial head excision in active throwing athletes. Post-op: Splint with forearm in supination or neutral. Start early active range of motion as soon as possible. Consider Indomethacin 75mg QD/NSAIDs for patients with complex dislocations for HO reduction. 7-10 Days: Evaluate incision, remove stitches, Begin early active range of motion as soon as possible. Start physical therapy. Avoid flexion in pronation. 6 Weeks: Consider static progressive nightime extension splinting if a flexion contracture is present 6 weeks after injury. 10° to 15° flexion contractures are not uncommon. Radial Head Fracture Rehab Protocol.